Last week, OTalk went On Tour to the College of Occupational Therapists conference in Brighton (#COT2014). One of our presentations was about this journal club. We were keen to have an experiential component, but realised that, with only 18 minutes to play with, we didn’t have enough time for newcomers to sign up to twitter and engage in a tweetchat. So we put our problem solving hats on, and decided to go back to basics: pen and paper. We chose an article that people may have read recently (due to the time constraints of the slot, we knew that people wouldn’t have time to read the article prior to ‘OTalking’) and displayed the abstract on the screen. We had seven questions floating around the room on sheets of paper, and one rule: no ‘out loud’ talking! You might be interested in seeing what some of the paper-discussions looked like. Hopefully, it might spark some questions or comments from you, and we can develop the discussion further in July. Question 1: Findings: OTs less likely than other disciplines to report changes to practice from research evidence. Why might this be? Question 3: Consistent finding: OTs reporting low EBP knowledge/skills/confidence. How can you develop yours? Question 4: Salls &al (2009) 12% of OTs reported frequent utilisation of EBP. Are you surprised? Why might number be so low? Question 5: Barriers: workload/time/resource pressures, lack of training/skills/support, quality of research, motivation. What do you think? Question 6: Implications: identify ways of making EBP personally relevant to practitioners. Ideas of how to do this? 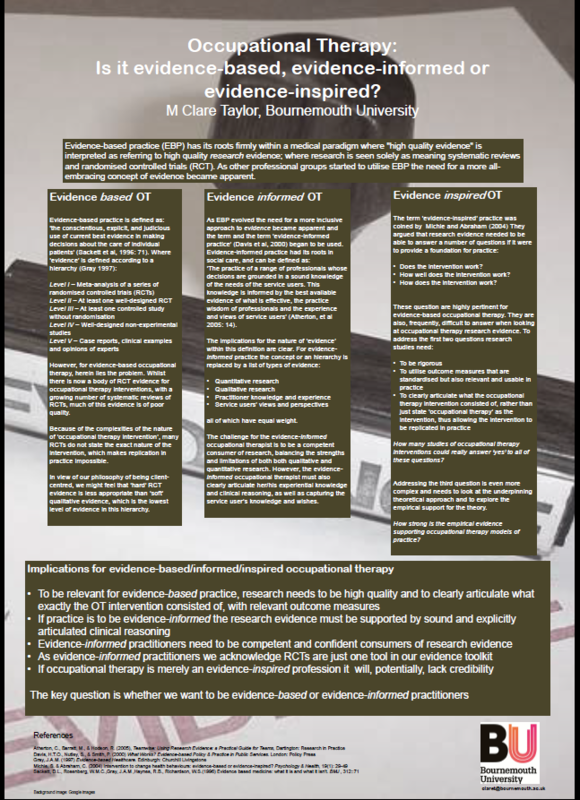 Additional resources from Clare Taylor (@ClareTaylorBU), Clare has kindly sent us her poster from COT2014 conference to add to the resources from this chat.